Are you a Lego mama? I am. My son has tons of Legos. Like, bucket-loads. I’ve spent time setting up a pretty sweet containment system for all the chaos, but those instruction booklets? Aye yai yai. I swear, my friends, Legos will be the death of me! So, for like 8 years I have saved the Lego instruction books from the grips of a little boy who would otherwise completely destroy them. He is finally old enough that I have relinquished my iron grip on these very expensive little books and allowed him to keep them. 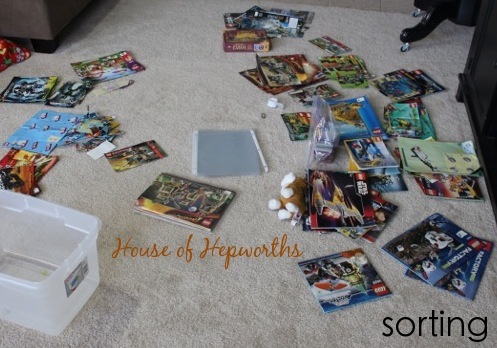 The booklets have been stored in a plastic container with a lid. They have seen better days. The problem with storing them piled in a plastic bin is that when the boy decides to look for a book, he tears through the container until he finds the book he wants. And then we end up with trashed booklets. And mama cries. 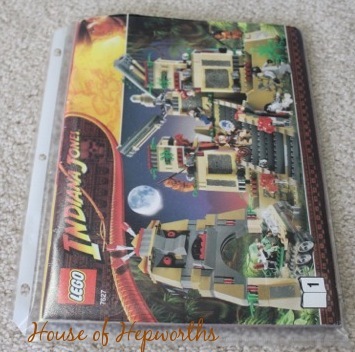 Did you know every time you throw away or destroy a Lego Instruction Booklet, somewhere out there a Mini Figure dies. It’s true. We have killed too many mini figs. It was time for a new solution. Leanne is more creative than I, and fortunately I found an idea that she used for all those booklets. 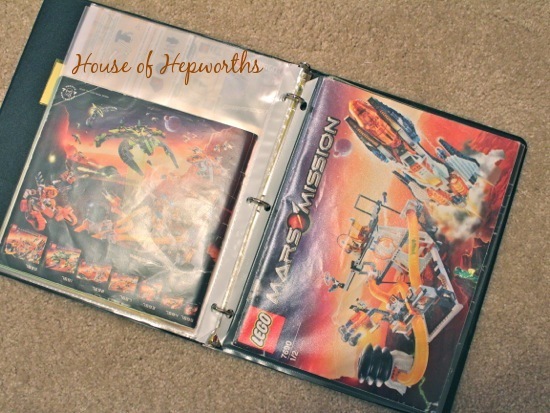 Drum Roll… Lego instruction booklet binders. I read her post a year ago, pinned it, and have been meaning to get on it since then. Well, finally I did it. 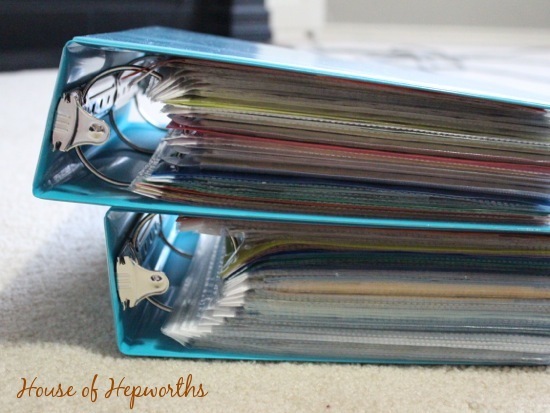 I hunkered down and stuffed those booklets into nice organized binders. I started by dumping out the bin and sorting all the books into piles by theme (Star Wars, Mars Mission, Indiana Jones, etc). Once I had my piles goin’ on, I took all the itty bitty little instruction cards and taped them onto cardstock. 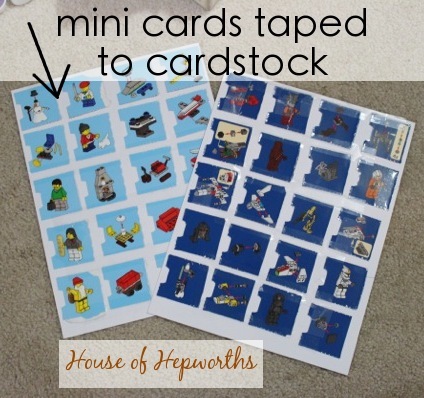 These mini square cards are from the Advent Calendar he gets each year for Christmas – I save all the little cards so he can rebuild his little treasures. And like I said earlier, I had to do some damage control on several books. I just taped them all back together using scotch tape. As for the stuffing, I just purchased a few packages of sheet protectors and a couple binders. Each book gets stuffed into a sheet protector. When the boy wants to build a set, he removes the book from the protector, builds his set, and then returns his book back to the protector. Seems simple enough. Yet, then again, this child is the most unorganized little human on the planet, so we’ll see how it goes. As I stuffed the books and created my cardstock pages with all the mini cards, I added them to the binders. Super simple, and so much easier to find a particular book without destroying every other book in his path. And just as a refresher, here’s how we store Legos in his room. 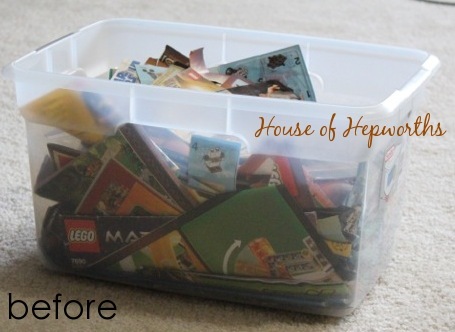 Do you have any other really awesome Lego storage ideas? I’m always open to new ideas. There’s pretty much nothing worse than stepping on a Lego while barefoot, so any new ways to keep them away from my arches is gravy. I like this idea. 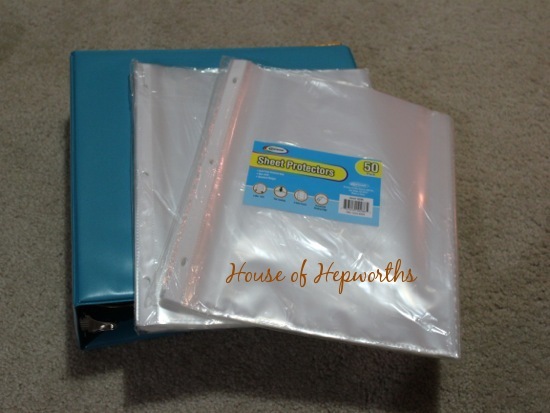 Binders for booklets. We had a LEGO storage BREAKTHROUGH at our house recently. I can’t really do the drawers/table storage because I have a one year old that will eat them. I was crushing on a swoop bag, but didn’t want to spend the $50 for it. Over Christmas break, I made my own out of a round table cloth that I don’t use anymore. It functions as a playmat, and when they are done they just grab the bag and cinch it up. Now, some ideas are great in theory, but the kids don’t follow through. This one, they really do! 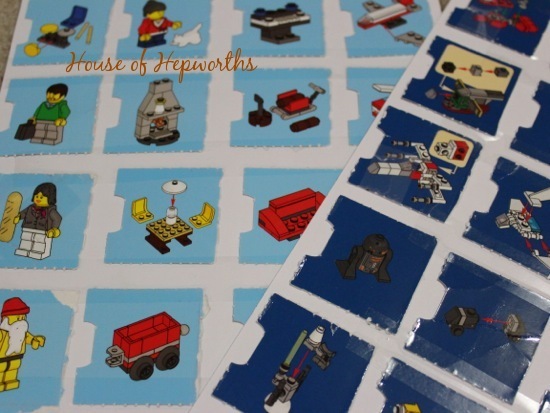 I’ll go in their room and there LEGOs are spread out all over the bag/playmat, and they can clean it up in minutes. (They don’t like stepping on LEGOs, either!) Inside the bag, we have some clear, plastic containers for some of their treasures that they keep separate, and a lot of their built ones are on a shelf. The other great thing about the one I made versus the one for purchase is mine is over 5′ in diameter! I keep meaning to blog about it and post pictures, but haven’t made it that far yet! Wow, now that’s organized! 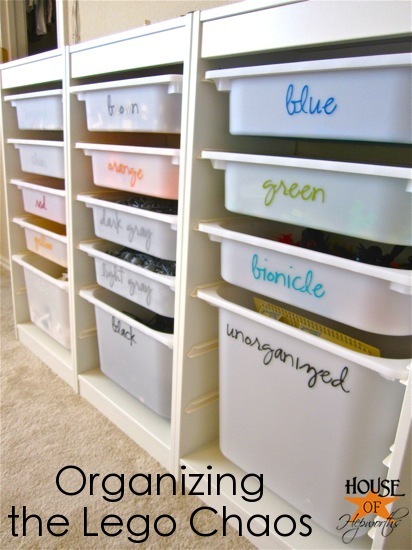 If my child had that storage shelf bins, the “unorganized” bin would be overflowing and the brown, black, green etc… bins would be empty! HA! I am so going to have to do that with my son’s Legos. I am in the process of organizing his Legos right now. He doesn’t have near as many and we are limited on space to store them but it has to be something that my baby can’t pull out because he loves to play with my older son. To start the process I bought two snap and go store containers from Hobby Lobby, well actually they weren’t the name brand but look just like them and since they were labeled spring I got them for 40% off. He has a bookcase that holds them right now so my plan is to keep them in the bookcase. To make it look “pretty” I saw some fabric baskets at Target that match his room that I am going to use to put the containers down in. I know I am going to have to buy some more containers but I want to sort his small pieces before I do and hopefully Hobby Lobby will have another snap and go container to match the two I already bought. I bought the only two they had that day. My little one has outgrown the train table, so now it’s a Lego table. We had been storing the Legos in plastic pencil boxes that I grabbed (on clearance) after school started last year. That was great for when he had 5 or 6 sets…..not so much now that he has over 20. 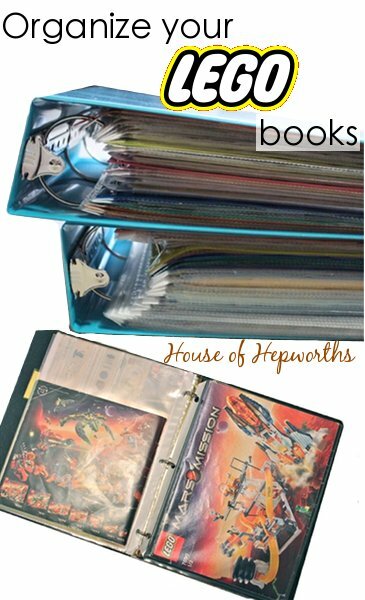 I had been storing the books in a binder like you’ve demonstrated and it makes it so much easier to keep up with everything. We’re definitely going to have to update our storage solutions though. As for his mini figures, they’re kept in one of those plastic bead organizers. Each figure gets their own little square to hold themselves and their accessories. So many storm troopers, so little of space. Oh, I feel the pain! After two grown son and literally hundreds and hundreds of dollars spent on them, they have all ended up in the basement in plastic containers, torn apart and no rhyme or reason. (except what the dog and the sweeper ate) I almost laughed when I read this. 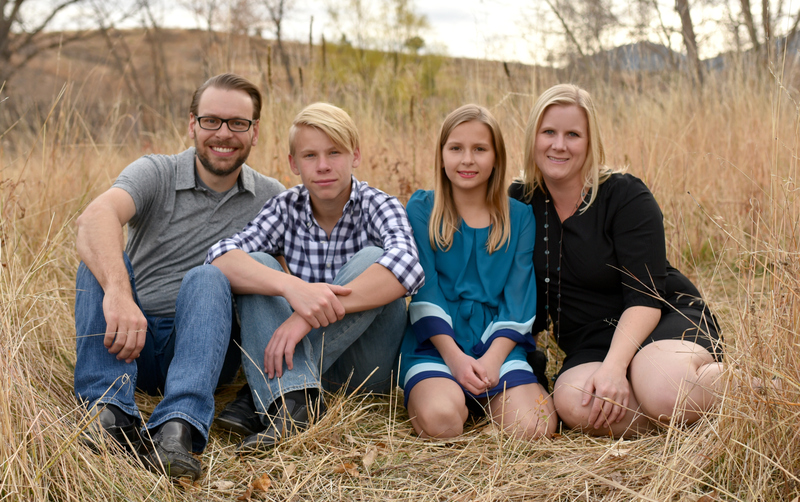 Thank you for the post, it was so enjoyable to read what other parents have gone through! 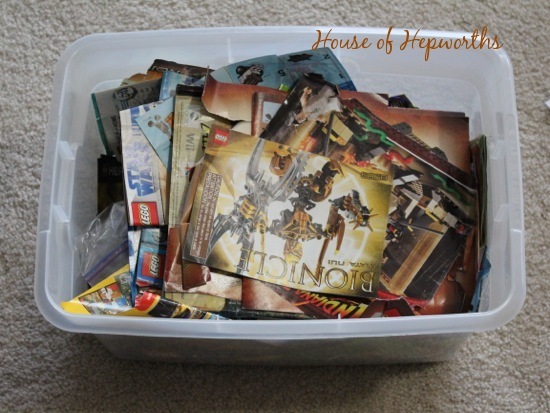 We use shallow, clear, long storage bins to keep Legos sorted by color. They fit under beds & are easy for the kids (and guests!) to clean up. 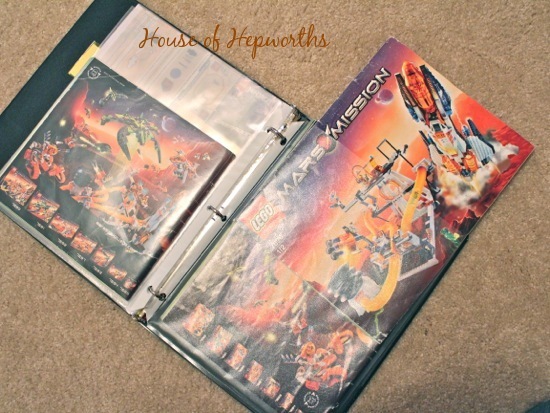 Also, we’ve been using the binder idea for a few years now. And, I concur with the author…it works great! 1. Use a quality plastic page/magazine protector. 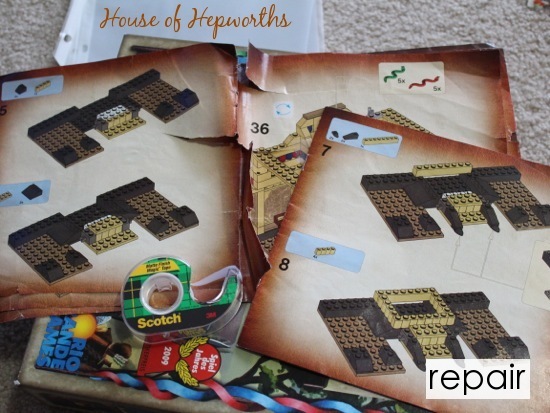 If you use cheap stuff, the plastic can stick to the booklets. 2. 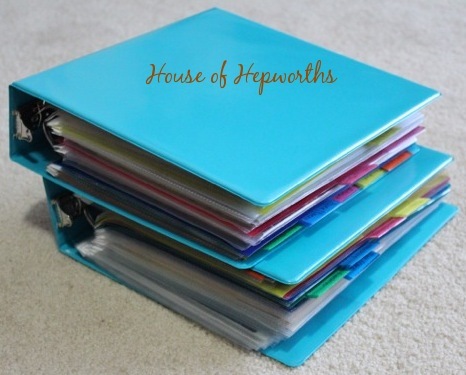 Use smaller binders (nothing more than 2″), else it’s too heavy for little people to handle. 3. Consider using poly zip envelopes in the binders. If they aren’t hole-punched, do it yourself. if they tip the binder over).